It was another awesome and successful visit to one of our family meeting in Ngwo zone Enugu Biafra land on 25th of September 2016. The BTV Enugu media team who came along with us did a live coverage of the meeting. This visit was a purposeful one. We went to determine and confirm how resolute and strong the zone is doing in accordance with the standard set out by the IPOB leader Nnamdi Kanu. 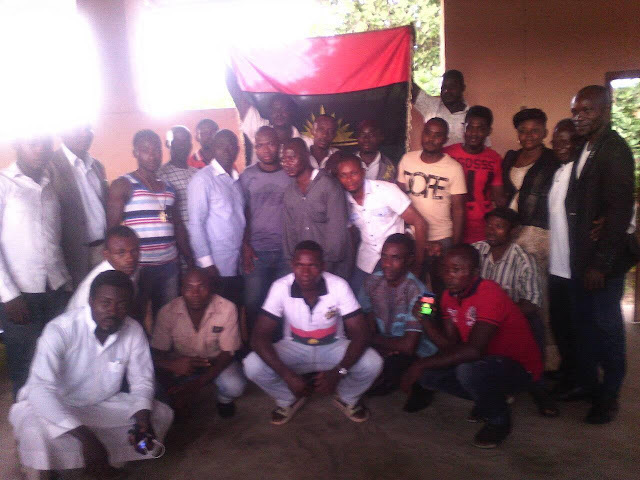 The meeting started by 4:00 pm Biafran time, followed by Prayers and worship songs of Chukwuokikeabiama. The Coordinator of the zone, Miss. Ngozi Onyia (the only female coordinator in Enugu) welcomed and addressed the members and the Biafran Anthem was recited with great passion. The BTV Enugu team leader, Mr.Egbo Chinoso also introduced himself and the whole media team including a member of the great Family Writers, Mr. Egwuatu Chukz. During the meeting proper, Interviews were conducted to get a first hand information about the progress the Zone is making towards the struggle for the restoration of Biafra despite the continuous detention of IPOB leader, Mazi Nn,amdi Kanu and the continuous killing of IPOB members by the security forces of the contraption called Nigeria. Among the members that were interviewed included people of diverse professions. For instance, Mr. Chiegornu Elisha (a patron), Mr. Eze Alfred Chekwube a business man, Mr.Oke Benjamin Chikezie also a business man and many more of them. - Ma, What is your name? - My name is Ngozi Onyia the zonal coordinator of this IPOB zone. - Please Before I will proceed, you are the only female coordinator in Enugu and we want to know how you are managing to coordinate a zone full of men? - (she smiled) Well! All I can say is that Chukwuokikeabiama is involved, and I also work and take decisions with all the members of my executives. - As the coordinator of this zone, is there any challenges that you are facing? - Of course there is, but not much because as far as I am working under one central command of IPOB and abiding by its principles or regulations, everything will always be taken care of. - Since you have been coordinating this zone, have you and your members ever receive any support from any Igbo politicians? - No, but they rather send the army and the police to kill us just because we are requesting for freedom. - This Zone is located in rural area, What are the greatest challenges the Ngwo community is facing? - The community face the threats of invasion, several killings and attacks by the Fulani herdsmen, and the community lacks any infrastructure and many more challenges. - OK thank you very much. Our prayer is that the most high creator (Chukwuokikeabiama) will continue to bless all the dedicated freedom fighters with all our needs and that at last we shall all rejoice in his name. - Such has never happened and from all indication it will never happen so long as as Chukwuokike Abiama lives. - it was powerful, very fantastic and tremendous. We were surprised that our people will respond to the voice of our able leader in such a glorious manner (they uniformly responded). In conclusion the zonal coordinator Miss. Ngozi Onyia appreciated the efforts of the members of the zone towards their fervent contributions for the struggle for the restoration of Biafra and she also extended special appreciation to the BTV Enugu team which includes; Mr. Andywems Opara, Mr. Udemba Kelechi, Mr. Egwuatu Chukz and the team leader Mr. Egbo Chinonso. The meeting was concluded with prayer and chanting of Biafra motivational songs.